Enlitic is using the same sort of technology that can recognize faces on Facebook to make medical diagnosis. They are applying the technology to x-rays and other diagnostic tools to recognize cancer and other problems that might not always be obvious to a doctor. But the company is then using big data and taking the diagnosis process farther by looking at lab results, insurance claims and other records associated with a patient to try to refine a diagnosis. The software is only about a year old but it’s reported that it is already making big strides in providing accurate diagnoses. One use of this technology will be to identify cancers early. Possibly the biggest potential use of the software will be to provide diagnosis in third world countries where trained doctors are scarce. Using a combination of wearables and big data, the Michael J. Fox Foundation is undertaking a large trial to gather data on people with Parkinson’s disease. It has always been difficult for doctors to understand the stage of the disease in a given patient due to the fact that the disease progresses in so many different ways. The trial is going to use smartwatches to monitor and report the movements of participants 24/7 and to gather other health data from thousands of Parkinson sufferers with the goal of building a database that will allow big data to identify trends and datapoints about the progression of the disease. The hope is that this will allow doctors to better understand the condition of any given patient. Big data ought to be able to spot trends in the progression of symptoms that have baffled doctors. In a totally different use of technology, the combination of IBM’s Watson supercomputer and Siri are teaming up to bring the power of the supercomputer to the point of patient interaction. Apple and IBM are working together to create a platform that will allow doctors and first responders in making diagnosis and in gathering the needed data on a given patient, on site, anywhere. In essence they are bringing the diagnostic skills of a doctor into the field. The two companies believe that this same technology can be used in many other applications but are tackling mobile health first since they see it as a market in need of a solution. The two companies are providing the platform and have invited app writers to design programs that can take advantage of Watson’s computing power in a medical setting. In news that many people might find disturbing, it’s been reported that medical insurance companies have been investigating the use of big databases that are commercially available from social media and other sources. These databases are already used to paint detailed pictures of us to use for advertising purposes, but some of this data also can tell a lot about our lifestyle. People don’t seem to much mind that this data is used to predict the next car they will buy, but are going to be a lot less comfortable if our insurance company looks to see how much alcohol they drink or if they watch a lot of TV. I doubt that the insurance companies even know how they might use this data yet, but one would think it might eventually be used in setting insurance rates that are specific by person based upon their health profile. Finally, at the other end of the spectrum from big data is the whole trend of developing tiny devices that can be used to monitor us. There has been a lot of progress made in developing smart pills that can be swallowed and that can provide feedback from the intestinal track. There has also been a lot of progress in developing stick-on monitors with tiny chips that are allowing diagnostic tools to replace the maze of wires that have been connected to people in the past. A friend of mine just visited an emergency room and was connected to tiny wireless monitors rather than the typical array of wires. And there has been significant research into tiny blood monitors that swim around inside the blood stream. 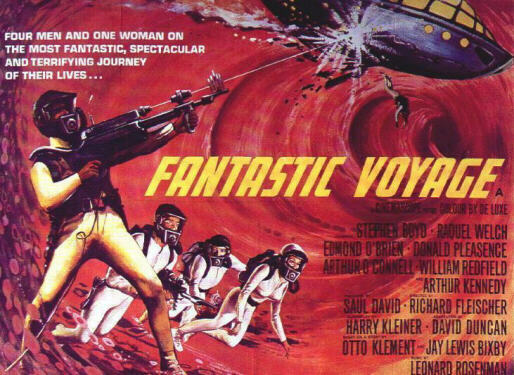 If anybody remembers the movie Fantastic Voyage you can see the potential for tiny medical devices inside the body that can find and fix problems at the cellular level. But we are probably still a long way from having tiny people inside of those devices!